Bernadette Smith travels with neither a camera nor a sketch pad. 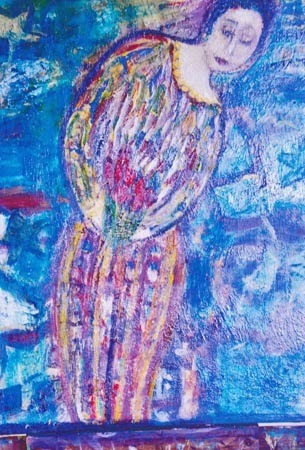 Yet on her return from a spring 2014 tour with Uzbek Journeys, she started a series of canvases of her impressions of the country and its people. She would rise early and roam the back streets. While others were busy snapping images, Bernadette keenly observed the scenes around her and let the impressions just soak in. 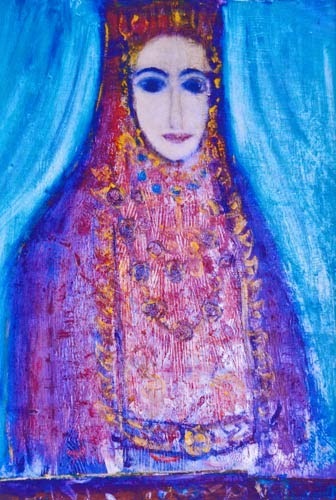 Bernadette claims that Uzbekistan "got under her skin" - this is apparent from the bold strokes and colours that dominate her work. Her first works are these three paintings of Uzbek women. At right is Nargisa, an apprentice woodblock printer in a contemporary studio in Tashkent. She is a talented, shy and serious young woman. 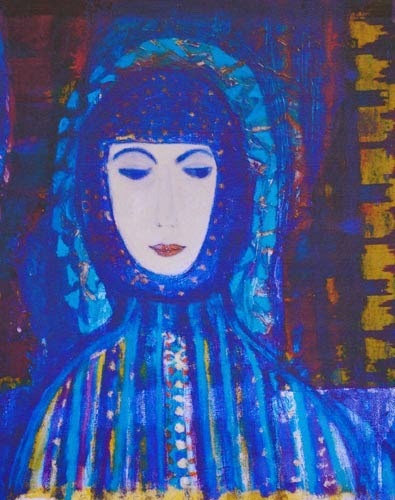 The work below, Impressions of Tamara, refers to the remarkable dancer, Tamara Khanum, the first woman to dance without a veil in Uzbekistan. There is a house museum in Tashkent devoted to her, which is visited on an Uzbek Journeys tour. Bernadette took a post-tour excursion to the Ferghana Valley. It is a long and spectacular drive over the Kamchik Pass. It was spring and children pick wild flowers and sell them by the side of the road. The painting below, Girl Selling Tulips, Road to Ferghana, charmingly captures one young girl. Bernadette is now working on a series about Khiva - certainly something to look forward to. As marvellous as digital photography is, these paintings show how wondrous thoughtful reflections are after a journey. Plus you need talent!